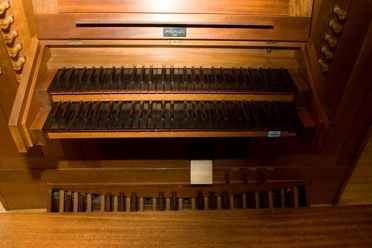 In the fall of 1967 the Baroque style organ built by Fritz Noack of the Noack Organ Company of Georgetown, MA. was dedicated with a concert featuring organist Anthony Newman, with faculty member Robert Koff , violinist and director of the Brandeis University Chamber Orchestra. 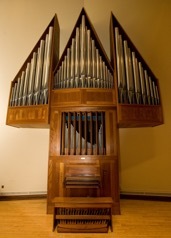 The organ was commissioned by the Aber D. Unger Foundation specifically for the Slosberg Recital Hall. Recitalists on the Noack have included Gustav Leonhardt, Marie-Claire Alain and Anthony Newman. The instrument is available for lessons and practice, and is often used to accompany the University Chorus and Chamber Singers.